The number of credit cards in circulation in Ireland (that is Eire, the Republic of Ireland, which is not a part of the UK as Northern Ireland is) more than doubled in a single decade from just about one million in 1997 to 2.3 millions in 2007 the last year for which there are official figures. The number of credit card transactions also increased from around 59 million in 2000 to 114 million in 2006. Ireland is slowly becoming used to the idea of using plastic on a regular basis both in the form of credit cards and debit cards after years of being a nation that (rather sensibly some might say) preferred that all financial transactions be settled by cash or check only. 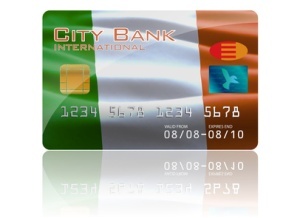 Travelers to Ireland from other countries do need to be aware of the fact that credit (and debit) card usage while gaining in popularity is still not universal in Ireland and although most shops and hotels in bigger towns and cities readily accept MasterCard, VISA and Express it is still best to carry along some cash if visiting smaller towns and more rural areas as many merchants there still do not accept plastic of any kind and ATMs can be hard to find as well. Who Issues the Most Credit Cards in Ireland? The number one issuers of credit cards (and charge cards) in Ireland are The Bank of Ireland itself and American Express. Other major issuers include Lloyds TSB, Nationwide, Natwest and American banks Capital One and Citi. As the concept of widespread credit card usage continues to grow in popularity more and more local Irish banks are offering their own credit card products as well. With increased credit card usage unfortunately comes increased individual credit cord debt. Although the problem is not nearly as widespread in Ireland as it is in other countries (including the UK) a recent consumer survey conducted by an Irish debt consolidation firm found that a record number of Irish citizens – over 100,000 – admitted that in 2011 they were having trouble meeting their credit card repayment obligations. While those living in the US and the UK have been very familiar with the concept of credit scoring for year now many Irish citizens are still somewhat unfamiliar with the concept. Credit scores in Ireland are calculated by The Irish Credit Bureau and they have in been in existence since 1965 but it is only recently that they have come to the attention of many Irish people as they applied for credit cards. The Irish credit bureau calculates credit scores in much the same way as their counterparts in the UK and US do but they are the sole credit reporting agency, which does level the playing field for consumers a little. In the US, where there are three major private credit bureaus it can be hard to keep up with your real credit score as each bureau tends to have slightly different information. There are some differences between the way Irish credit reports and credit scores are maintained though. A credit note or entry can only stay on an individuals credit report for a maximum of five years, whereas it can linger for seven on a US credit report. Bank overdrafts are not usually reported on a credit report because they are negotiated between a bank and its customer ahead of time. According to the Irish Credit Bureau themselves a credit report they produce only includes the following: name, date of birth and previous addresses, the name of all lenders with whom an individual has had accounts in the last five years, records of all payments made on those loans including late payments and information on any loans or credit lines that were “charged off” in the last five years. Any Irish citizen has the right under law to ask to be provided with a copy of their credit report. They are not however offered this free, there is a 6 Euro charge per credit report but no limit on how often one can be requested. As they use them more and more Irish credit card holders are looking for the same kinds of perks and rewards that other credit card holders across the world do. Rewards credits cards are popular as are cash back credit cards. The VISA Piggy Bank Card (a very cute affair with a big pink cartoon pig on the front) is one of the most popular cash back credit cards. It offers one “Piggy Point” for every 2 euros spent and Piggy points can be redeemed as cash back or for gift certificates, The APR on the Piggy Bank Card is very reasonable as well and there is a 0% APR attached to the card for the first ten months of card membership. Most Irish credit card holders are, at the moment, most interested in low APR cards and credit cards that offer a longer grace period than others. Many of the most popular Irish credit cards now come with a 58 day grace period on purchases which means that as long as a charge is paid off in a little over two months there will be no interest added to it.